When most students at your college are in your major it makes it easy to make connections. 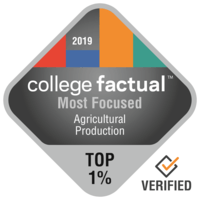 Learn why so many students study Agricultural Production at the schools below. What Utah Schools are the Most Focused in Agricultural Production? Visit the Most Focused Ranking methodology page to find out more about how the schools below were chosen. Any student who is interested in Agricultural Production has to take a look at Southern Utah University. Students who like a more relaxed life will value the school's position in the not so big town of Cedar City, Utah. Quite a few Southern Utah University first-year students get scholarships. Parents, you'll be glad to learn Southern Utah University features a relatively low crime rate. Take a deeper dive and see just how well Southern Utah University ranks in other categories. Utah State University is a great option for students pursuing an Agricultural Production degree. With more than 20,000 students, this institution is one of the biggest schools in the nation. This school provides graduate degree programs for students who need to carry on after earning a bachelor's degree. This school is thought to be a good option for those in the military. Get all of the crucial facts on USU by looking at their scorecard.